As of September 8, the Battlefield 1942 master server we've all been using since Gamespy went away has been moved to a different IP address. Initially it looked like this would be temporary change, but they later announced that the change was permanent. The old IP address will continue to work, but the service operators recommend using the new one (94.23.196.155). I also changed the HOSTS file on the TPU server, so players should be able to join and the server should update its status on various server trackers as before. 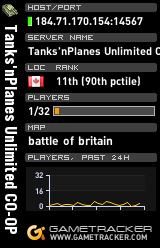 In related news, the server list at http://master.bf1942.sk/ is back online.